This morning and afternoon I gave my first talks of the season at Bates Nursery and Garden Center in Nashville (go see them--they are awesome), and one of things I promised the attendees is that I would post a few pictures of how I keep insects from laying eggs in my SFG boxes. 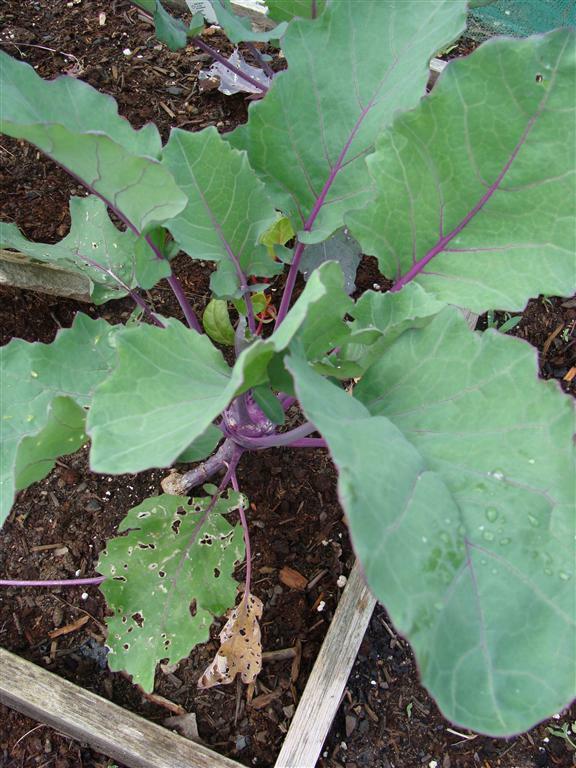 The structure is similar to protecting them from frost. I put up frame made of 1/2" schedule 40 PVC pipe and drape it with fine netting--the kind used to make bride's veils. It comes in widths up to at least 180" (although not every fabric store will have it that wide, so you might have to get it online). 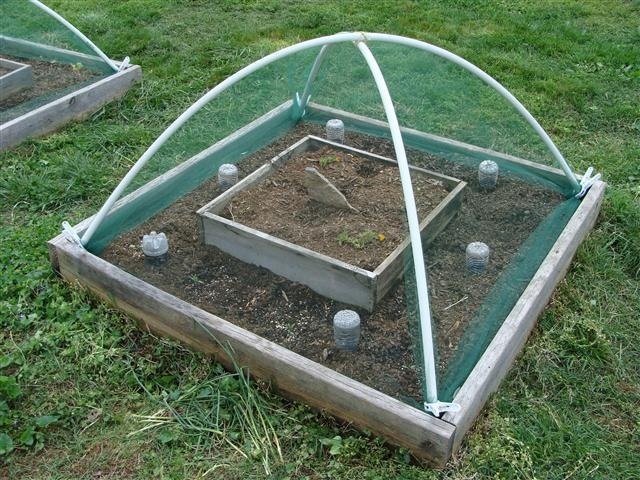 I clip it to the frame with the same clips that I use for making the cold weather hoop houses. 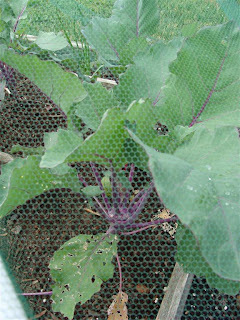 ....and as you can see with the netting lifted, there was no further damage on the plant from then on. This does not mean the bugs didn't keep trying. 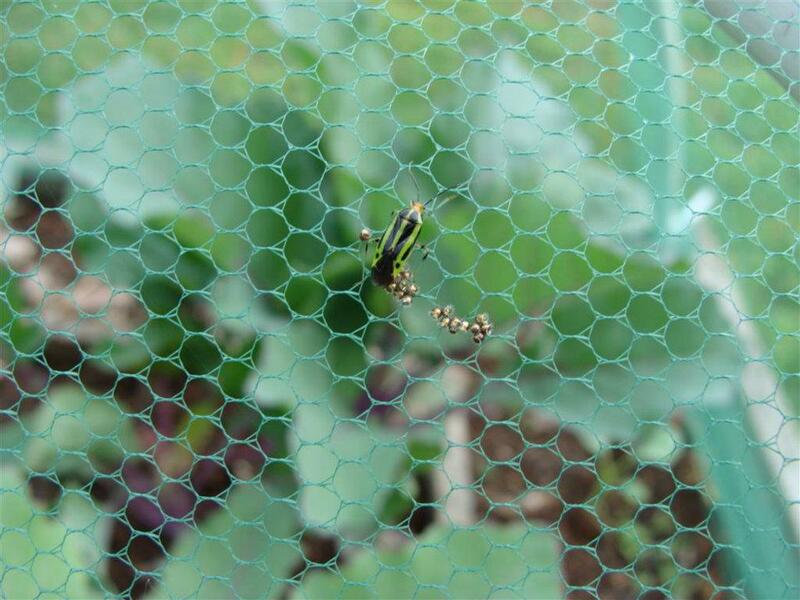 Here is a shot of a bug that actually just laid her eggs right on the net! I crushed those eggs, because when they hatched the little guys would have been small enough to get thru the holes. (I felt HORRIBLE about destroying those eggs. That is another post for another day). I used to make wedding cakes and always used this type netting ( in white or creme color of course) to drape over the cake if it was an outdoor reception site, because how disgusting is it for a cake setting out to be covered with flies etc. after the sweet icing. So now that I garden I have been saving that netting for some good use and this is perfect idea.